I voraciously devour any books on perfume that I come across, so as soon as I saw this book at my favourite online book purveyor, in my cart it went. The title, Scent and Subversion, Decoding a Century of Provocative Perfume, spoke to me as did the sensual cover. The minute I opened the book, I was hooked. Barbara writes about perfume the way you might discuss a long lost lover, which some of the fragrances she describes truly are. Due to IFRA, the perfume industry's regulatory body, diminished availability of raw materials and bean counters who want to cut costs, many classic fragrances are no longer available, or they just smell different. The last 10 years of my professional life have been dedicated to artisan perfume, working in London for Miller Harris, Floris and Penhaligon's and being a distributor or agent for those brands in Australia. Recent developments in my business, such as conducting perfume master classes for clients, means that it has been necessary for me to embrace more commercial fragrance brands. In some cases, some of the new releases have honesty surprised me, such as Honey by Marc Jacobs, but most of the time, I find that they lack substance, soul even. Reading Scent and Subversion reminded of how classic fragrances have a story behind them, and highlighted how different they are from the boring, watered down drivel designed to appeal to the masses we have today. 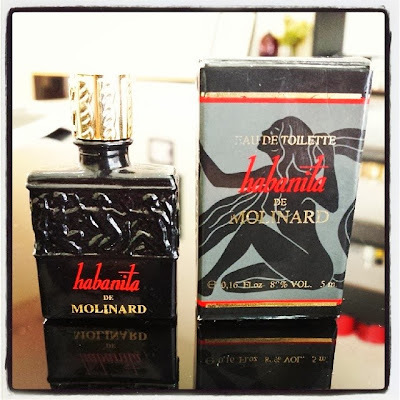 Barbara points out that perfume was once a way for women to express their raw sexuality in a time when they didn't have the choices in life that modern women do. They couldn't do a Miley and twerk on a married man, while wearing a rubber swimsuit and waving a foam finger. Not that they, or we, for that matter would want to, but back then, you expressed your sensuality with a provocative perfume and a subtly arched brow. There follows a comprehensive selection of some of the most provocative perfumes since 1882. I have counted no less than 32 fragrances that I simply must own. After a late night spent scouring the internet, the first landed on my desk today, Habanita de Molinard, originally created as a fragrance to apply to cigarettes to make the smoke even more fragrant. Since reading The Perfume Lover by Denyse Beaulieu, I have been desperate to smell this decadent fragrance and I can say it doesn't disappoint. I would love to create something as marvelous as a fragrance for cigarettes, but I am pretty sure it would be frowned upon. Smoking is not as glamorous as it was in the 20's, now we know the effects and the enticing ads have been replaced by ads warning us about cancer and poor health, not that I remember that when I hit glass no 6 of wine and fancy a surreptitious ciggie. Warning - this book is filled with descriptions of fragrance you will want to own, nay, must own. 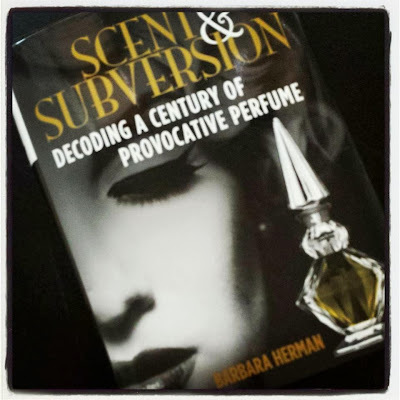 If you love perfume, Scent and Subversion is a wonderful book and Barbara is an engaging writer. The book has lots of vintage perfume advertising, another obsession of mine, beautiful illustrations that tell the story of the perfume better than a leggy model lolling in a field holding a factice or perfume. When I lived in London and worked for Miller Harris, we held perfume and wine matching master classes in our Mayfair store. There is so much synergy between wine and perfume and it was lots of fun exploring the similarities. I have wanted to do a Perfume and Cocktail Master Class as a follow on from the Champagne and Perfume Master Classes I did earlier in the year with The Champagne Dame so I contacted 1806, one of Melbourne's best cocktail bars. Luckily, Colleen, who looks after the PR and Marketing, loved my crazy idea, and Dan, a wonderful mixologist got to work creating some amazing cocktails. First up is the Floral cocktail, a gorgeous concoction of rose and nashi pear on a base of vodka. The second cocktail was the Fresh cocktail, a chamomile and citrus reduction over a gin base, it was like sipping on liquid sunshine! The star of the show was undoubtedly the Wood cocktail, ooh and aahs echoed around the table as Dan and Colleen set them down. They were presented in an apothecary bottle with The Powder Room logo with smoke billowing from the top. A whiskey base, Lagavullen my favourite single malt, was served over a single cube of ice and the cinnamon stick was set on fire. Incredibly delicious and well presented. Some people ask why perfume and cocktails? I say, why not? I love perfume, I love cocktails, they both take you on a sensory journey, and I like a drink, so why not combine them? This event is be available for private functions at The Understudy at 1806. Please contact samantha@thepowder-room.com is you would like to book. Minimum 5 guests, $95 per person.